A collaboration between celebrated Napa Valley vintners Mike Smith and Mark Carter who each had their own label specializing in Napa Valley Cabernet Sauvignon: Carter Cellars (Carter founded it in 1998) and Myriad (Smith founded it in 2009). Carter owns the Carter House in Eureka, California, where the 301 restaurant has a Wine Spectator Grand Award wine list. Smith began working for Thomas Rivers Brown in 2001, and Brown introduced Smith to Carter. 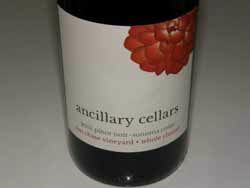 The pair released their first Pinot Noirs under the Ancillary label in the 2012 vintage. A Chardonnay followed with the 2014 vintage. Vineyard sources for Pinot Noir include Sangiacomo Vineyard and Sun Chase Vineyard, both located in the Sonoma Coast. The wines are sold through allocation by mailing list.